The Special Edition YFZ450R features GYTR performance parts and a color and graphic scheme that looks fast standing still. RACE-READY ERGONOMICS: The body configuration allows more room for the racer to move around during the moto. The seat is narrow in the front, yet wide and padded in the rear to reduce fatigue. DURABLE, RIGID WHEELS: The wheels have been designed with the inner lip rolled in. This increases the rigidity, allowing a reduction in weight while maintaining strength. WIDE TRACKS AND MAXXIS® TIRES: Wheels are set motocross-spec wide, near the maximum allowable 50 inches, for great cornering speed. Maxxis® tires help provide excellent handling and control. At 20 inches in the rear and 21 inches in the front, they provide better ground clearance than the competition. ADJUSTABLE HANDLEBAR: Large diameter, tapered handlebar reduces vibration and are mounted on 4-way clamps for exceptional adjustability. The two sets of holes in the handlebar crown and the eccentric clamps allow a rider to choose the standard setting, 10mm or 20mm forward, or 10mm back. WIDE FOOTPEGS: Foot pegs are a generous 2.6 inches wide, something riders will appreciate every time they want to get up on the pegs. ADVANCED FRAME: The frame is a combination of aluminum and steel for light weight. The frame member under the engine is steel, used for its combination of strength and low profile. This allows the engine to sit lower overall for excellent mass centralization for unmatched handling. The aluminum frame is bolted together, rather than welded, for maximum durability. LONG A-ARM SUSPENSION: The front frame is as narrow as possible at the A-arm mounting points. This increases the A-arm length and reduces changes in camber as the suspension travels through its full range of motion. HIGH-PERFORMANCE SHOCKS: The front KYB® shocks are longer for increased stroke with superb bump absorption and excellent anti-bottoming characteristics, and they have Kashima™ coating for smooth operation. 9.8 inches of wheel travel means this racer is up to even the most challenging tracks. SWINGARM REAR SUSPENSION: The rear swingarm is crafted of strong, gravity-fed aluminum, and is matched to a fully adjustable 46mm KYB® piggyback shock for excellent handling. Rear wheel travel is 11.0 inches for comfort even on tough terrain. POWERFUL MOTOR: The fuel-injected 449cc engine has superb power characteristics. Power delivery is smooth and strong off the line with lots of midrange to top-end power. ADVANCED CYLINDER HEAD: The 449cc engine uses a five-valve cylinder head and titanium valve technology designed to deliver abundant power in the mid-range to top end, with more “hit” feeling right off idle. The high compression ratio further improves overall engine performance. 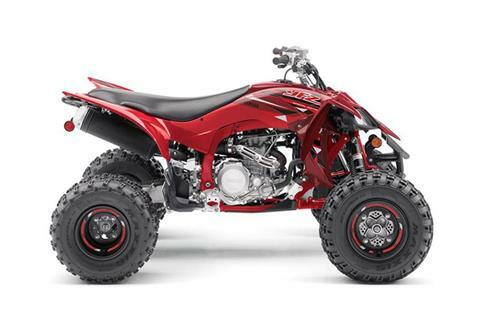 FUEL INJECTION: The YFZ450R incorporates Yamaha Fuel Injection for precise fuel delivery. With a big 42mm Mikuni® throttle body and 12-hole injector, this system provides exceptional atomization of the fuel for maximum power. The system also includes ISC (Idle Speed Control) for easy, reliable start-up and warming. ASSIST AND SLIPPER CLUTCH: An assist-and-slipper clutch reduces clutch lever effort for less fatigue while at the same time increasing clutch plate pressure for positive engagement. This clutch system also reduces engine braking effect, which allows faster cornering, particularly when downshifting. COMPACT COUNTERBALANCED ENGINE: The crankcase holds a crankshaft that’s ready to handle the increased demands of the racer, as well as a counterbalancer to reduce vibration. The crankcase also houses the oil tank, which helps to centralize mass for unmatched handling while making maintenance easier. TUNED CAMSHAFTS: Camshafts have been revised to help maximize the engine’s impressive power output from off the line all the way up to the top end. AGGRESSIVE SE STYLE: Aggressive styling gives the YFZ450R SE a racy customized look, with extras like a GYTR® front grab bar to match its unique graphics package. LIGHT THROTTLE ACTION: The throttle lever requires low effort for less fatigue during long motos. COMPACT LED INDICATORS: The discrete panel on the fender in front of the rider gives vital indicators about low fuel, coolant temperature, check engine, and neutral gear via an LED display. RACE-READY ENGINE: The YFZ450R is the most technologically advanced sport ATV on the market today. It combines a high-tech, quick-revving, titanium-valved, 449cc fuel-injected engine with a lightweight, professional-caliber cast aluminum/steel chassis. The power and chassis combination makes for a championship-winning machine time and time again. 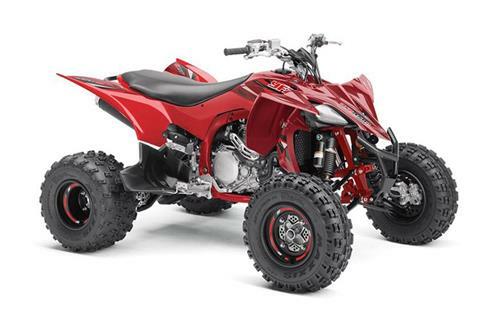 ADVANCED FRAME: The YFZ450R is motocross ready. The weldless frame is designed from lightweight aluminum, with a tension-steel bottom frame that lets the engine sit lower for excellent mass centralization. Suspension components and settings reduce weight while providing light, sharp handling and rider comfort. AGGRESSIVE BODYWORK: Bodywork is designed for great ergonomics and rider comfort, with more room to hang off in the corners, and the seat shape is padded in just the right places to improve lap times. Body panels come off easily without tools for service; there’s no need to remove the battery or other components to take the fenders off. ADVANCED CYLINDER HEAD: The 449cc engine uses titanium five-valve cylinder head technology designed to deliver abundant power in the mid-range to top end, with more “hit” feeling right off idle. The higher compression ratio further improves overall engine performance. ASSIST AND SLIPER CLUTCH: An assist-and-slipper clutch reduces clutch lever effort for less fatigue while at the same time increasing clutch plate pressure for positive engagement. This clutch system also reduces engine braking effect, which allows faster cornering, particularly when downshifting.